Show your support for safety. Submit an idea. Have something to say to Ohio drivers that could save a life? Submit a safety message. Watch for the winning submission on Ohio's freeway message boards. Due to the size of the signs, your submission has a character limit. A highway message can’t be longer than 51 characters (17 characters for each of the three lines). 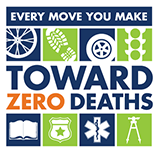 Intellectual Property: I agree and acknowledge that anything submitted in accordance with the parameters of this submission form is usable by the Ohio Department of Transportation (Sponsor), for use on social media outlets; in promotional material and advertising relating to Toward Zero Deaths; and on Dynamic Message Sign (DMS) installations throughout Ohio. All submittals shall become the intellectual property of the Sponsor and the Sponsor shall have an unrestricted right to reproduce, distribute, modify, maintain, and use the submittal. Submitter shall not obtain copyright, patent, or other proprietary protection for the submittal(s). Submitter agrees that all submittals may be made freely available to the general public, to the extent permitted by law. Limitation of Liability: By entering a DMS submission, the entrant agrees to release, indemnify and hold harmless the Sponsor and each of their respective agents, representatives, officers, directors, shareholders and employees from and against any liability of any kind whatsoever resulting from or arising from the submittal. IN NO EVENT SHALL SPONSOR BE LIABLE FOR ANY INDIRECT OR CONSEQUENTIAL DAMAGES, INCLUDING LOSS OF PROFITS, EVEN IF SPONSOR HAD BEEN ADVISED, KNEW, OR SHOULD HAVE KNOWN OF THE POSSIBILITY OF SUCH DAMAGES.